A daughter is a gift. The day she entered your life and this world is certainly not one that you will soon forget! This year, consider marking her birthday with a birthday wish that expresses your love for her. You are proud of her and the woman she’s become–there’s no better time to let her know. An incredible birthday message, like one of the options listed below, will make your daughter’s big day one to remember. She’ll always be your little girl, but she’s never too old to hear how much her mother and father love her. I love you today, I loved you yesterday, and I’ll love you every single day for the rest of my life. You are my daughter, and I am so incredibly proud of you. Never forget how wonderful you are, and that I’ll always be here for you. Happy, happy birthday, my gorgeous daughter. Happy birthday to my darling daughter! I am so proud of you and the kind, intelligent, beautiful woman that you’re becoming each and every day. No matter what obstacles may come your way, I will always be here for you. Today, let’s have an unforgettable birthday celebration! I love you! My beautiful, clever, charming daughter: happy birthday! Another year has gone by and you continue to make me proud with all that you do. Wishing you a joyful birthday and an exceptional, exciting year to come. It is the greatest joy of my life to be your mother. I love you endlessly and am so proud of you. Wishing you the happiest of birthdays, you truly deserve it! My beloved daughter, I am filled with pride just by being your mom. You are smart, kind, beautiful, and a joy to be around. I hope you have a simply wonderful birthday, I love you so much! My dear daughter, no matter how old and grown up you become, you’ll always be my little girl. Wishing you a very, very happy birthday and a year of love and good fortune ahead. I love you! Even as your father, I continue to be amazed by your boundless strength, intelligence, and beauty. You’re an incredible young woman and I am so proud of you. Wishing you a wonderful birthday, it’s time to celebrate! My beautiful daughter, wishing you an amazing birthday today! Always remember that I, your proud dad, will be here for you no matter what. Let’s celebrate, my dear! Happy birthday to my incomparable daughter. With each year that passes, I’m reminded of how lucky I am to be your dad. You’re growing up so fast and I’m endlessly proud of the young woman that you’ve become. Here’s to you, your many accomplishments, and the bright future that’s ahead of you! The big “Sweet 16” birthday is an important moment in every girl’s life, and it only happens once! She’s growing up right before your eyes, and it’s hard to believe how quickly she’s becoming an adult. But, she’s not quite there yet, so make the most of her 16th birthday with a beautiful birthday wish. It feels like only yesterday that I was holding you in my arms as an infant. Time has flown by, and now here we are on your Sweet 16! I love you and am so proud of you. Have an extraordinary birthday, you deserve all the happiness in the world. My beautiful daughter is turning 16! Wishing you the happiest of birthdays and a celebration to remember. I am so proud of you and will be here for you no matter what. Happy birthday, my dear, I love you so much! The Sweet 16 is a special, exciting occasion in any young woman’s life. My dear daughter, I love you so much and am incredibly proud of you. Here’s to you, a wonderful 16th birthday celebration, and a fantastic year to come! My darling daughter, happy Sweet 16! I love you more than you know and am proud to be your parent. May all your dreams come true in the year ahead! My kind, beautiful, charming goddaughter: happy birthday! Having you in my life is a gift and it’s a joy to watch you grow up. I’m always here for you, no matter what life throws your way. Have an absolutely wonderful birthday celebration, my dear! My lovely goddaughter, I’m glad to wish you a very happy birthday! May today’s celebration be all that you hoped for and more. You are a beautiful young woman that I am proud to know. Have an incredible day and an even better year to come! My dear, I am so proud to be your godparent. You inspire those around you with your kindness, intelligence, and optimism. May you have an exceptional birthday full of love and happiness!  My beautiful goddaughter, I hope you have a joyful birthday full of cake, presents, friends, and family. You light up any room you walk into and it is a pleasure to know you. Sending you my best wishes and all of my love! Express your enormous love for your daughter on her birthday with a loving message that will undoubtedly make her smile. You are so proud of her, and there are still many amazing things ahead. Your daughter’s birthday celebration will be one to remember for years to come. When your daughter was born, no doubt it was a wonderful and joyous occasion. 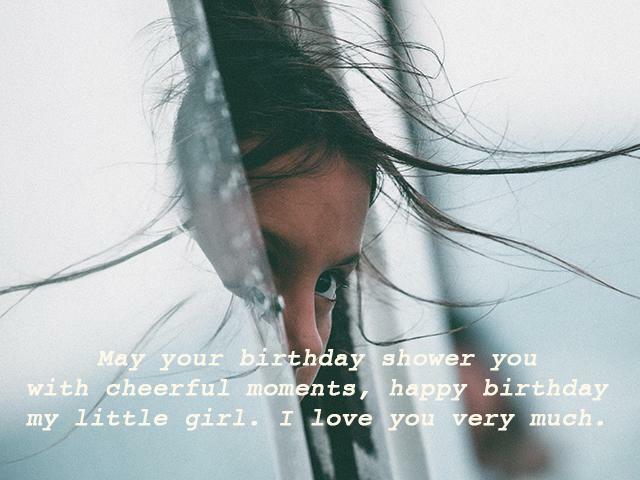 As she continues to grow and learn, you probably want to ensure that each of her birthdays is special and she knows just how important she is to you. A great way to do that is through a heartfelt birthday message. If you are struggling to find the perfect birthday wish for your daughter, there’s no need to worry any longer! 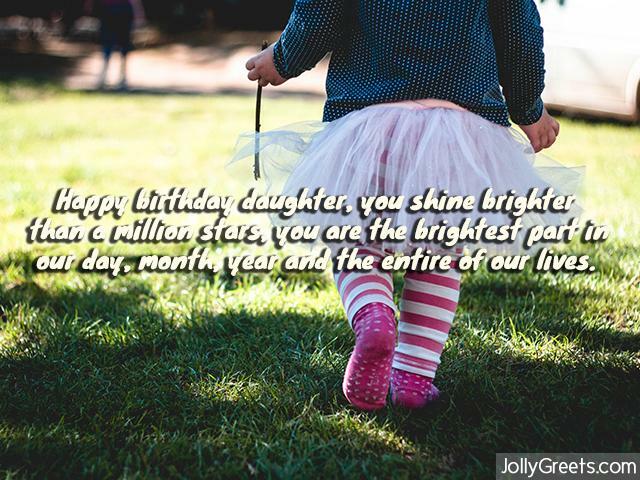 We have compiled a list of birthday wishes for your daughter that you can use or draw inspiration from. Check out the list below and don’t forget to make sure your daughter knows how special she truly is to you on her birthday! 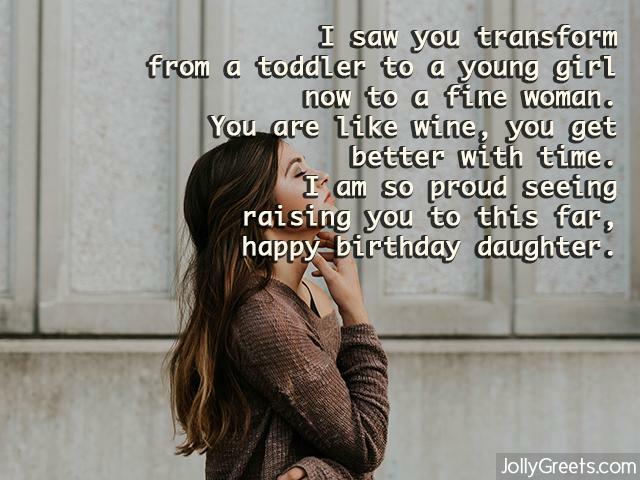 If your daughter has already grown and moved away from home, these mature birthday wishes are sure to warm her heart and remind her how loved she still is–even if she isn’t your “little” girl anymore. Daughter, watching you grow up has been one of the most meaningful, joyous, and impactful things I have ever done. Even if some days weren’t perfect, you’ve grown into the perfect young woman. Happy birthday! Happy birthday to my darling daughter! You have made us all so very proud and we cannot wait to see you continue to succeed. You are such a wonderful, inspirational, unique young woman and I am so proud to call you my daughter. I hope that this birthday is everything you could hope for. Happy birthday, my love! I am so very fortunate to have been blessed with a daughter as wonderful as you. May your birthday be filled with joy and laughter. When you were born, my life changed for the better. You have been an amazing daughter and I am so proud of how you have grown. Happy birthday! On the day you were born, my life changed for the better and has continued improving ever since. Happy birthday to the best daughter I could have ever asked for! Daughter, you have grown into a spectacular woman and we couldn’t be more proud of you. Happy birthday to my favorite girl! Happy birthday! You must have gotten all of your good traits from me. I am so proud to call you my daughter and I can’t wait to see what the future holds. It felt like just the other day you were a little girl and now you have grown into an amazing woman. I am proud to call you my daughter and know you will continue to achieve great things. Happy birthday! Happy birthday to the daughter that made me realize the world is full of wonders just waiting to be found. I love you, sweetheart. If your daughter is still fairly young, these messages will be sure to delight her and remind her of what a special little girl she is on her birthday. Happiest of birthday wishes to the sweetest little girl I have ever known! I love you so much, daughter of mine. I love you to the moon and back, sweet daughter. Happy birthday to you! Happy birthday, princess! Being your Mommy/Daddy is the greatest gift of all. My sweet baby, silly little girl, and beloved daughter: happy birthday! You’re another year older and wiser. Today is a special day because it’s the day my shining star was born! Happy birthday to the best daughter I could ever ask for. No matter how big you grow to be, you will always be my little girl. Happy birthday, sweetheart! You are the most beautiful gift I have ever received, daughter. I hope this birthday is everything you dream of and you continue to grow and achieve your dreams! I am so proud to see how big my little girl is becoming! Lots of hugs and kisses, happy birthday. Today is a very special princess’s birthday! Happy birthday, may you continue growing into a fine queen. My dearest daughter, we are lucky to have such a wonderful little girl in our lives. May this birthday be half as amazing as you are! If your daughter has a quick sense of humor and a sharp wit, one of these funny messages will be perfect to bring a smile to her face on her big day. All of the other moms may have given birth to daughters, but I gave birth to an absolute legend! Happy birthday. Keep being awesome! On your good days, I can see so much of myself in you. On your bad days… let’s just blame your Dad/Mom! Happy birthday! Daughter, I may scold you and you may drive me crazy… but today, let’s just celebrate! Happy birthday. Whenever skies are blue and sunshine seems so far away, remember it only takes a smile to brighten the day! Your silly smile always brightens mine, daughter. Happy birthday: may your sun shine always! We may not always understand each other, but for what it’s worth: you’re still a totally awesome daughter even when I don’t “get” you! Happy birthday. Happy birthday, shortcake! Let’s celebrate with some real sweet treats, gifts, and lots of laughs! Everyone keep calm: it’s my daughter’s birthday! Happy birthday, sweetie! Don’t tell the others, but you’ve always been my favorite daughter! Happy birthday! Happy birthday to the goofiest girl I know! May your life continued to be filled with laughter. Roses are red, violets are cool, sorry other parents, but my daughter rules! Happy birthday! Whether you copy it directly or tweak it to make it more personal, one of these birthday wishes is sure to be the perfect match for your perfect little girl. Whether your daughter is still a tiny princess or she’s grown into a wonderful young woman, her birthday is a very special occassion. Make sure that she knows just how loved she is and how proud you are of her. The best birthday gift you could possibly give is your continued love and support… but delicious cake and a present or two won’t hurt!